But will the government rise to the occasion created by the Gilets jaunes movement? But it’s worth noting that the government hardly set up any meetings or direct exchanges with the Gilets jaunes as such. Instead of reaching out to them, Mr. Macron preferred to engage with local officials or other ordinary citizens. Nor has the great debate spawned any real representatives among the Gilets jaunes — a vacuum that makes concrete negotiations difficult. 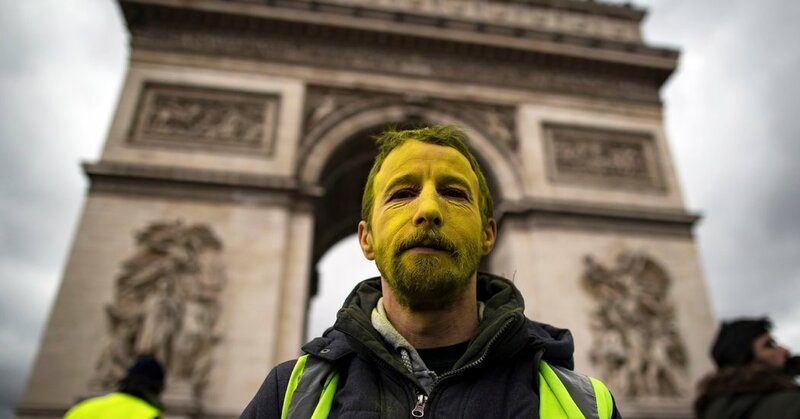 The movement’s very nature contributed to this, of course, since time and again the Gilets jaunes themselves pushed back against any attempt to structure or formalize their efforts. For a brief moment there seemed to be an impulse to create a political party from the movement or at least let emerge some official spokespeople. But that no longer seems remotely possible. Mr. Macron, even when faced with the breakdown of the political system itself, has continued to tackle problems from the top down and without resorting to intermediaries. Instead of moving away from this vertical approach, he has exploited it. His only credible political opponents now are parties at the extremes, on the far left (Jean-Luc Mélenchon and La France Insoumise) and the far right (Marine Le Pen and le Rassemblement National). According to polls, the president’s party is leading the race for the European elections. Was all this a strategic calculation? Quite probably. In any event, the situation today is a far cry from auguring the renewal of this democratic system. The most that has emerged so far is a handful of proposals from civil society — for example, the program for a greener economy jointly put forward by Nicolas Hulot, a former environment minister, and Laurent Berger, the head of France’s leading (and reformist) union, the Confédération française démocratique du travail (the French Democratic Confederation of Labor). France, unlike other countries, has been fortunate enough to experience a popular upheaval that has raised serious economic, social and institutional questions. Elsewhere — in Britain, the United States, Italy, Poland, Hungary — the discontent immediately lapsed into populism, nationalism or withdrawal. But if the French government doesn’t adequately address the legitimate, or at least reasonable, concerns of the Gilets jaunes, it runs the risk of pushing them, as well as other French people, toward the pitfalls France has avoided so far.